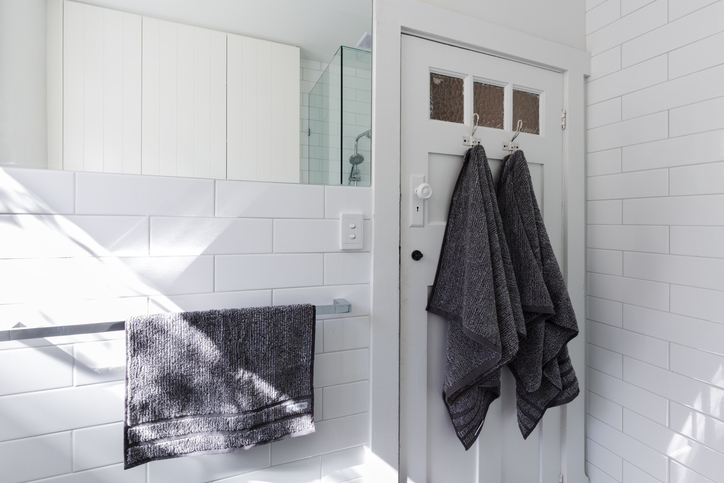 Adding more storage space to your bathroom can create a calm, relaxed, and organized atmosphere and make it easy for you to locate toiletries and important medications when you need them. Find bathroom storage ideas to consider by checking out some tips below. It can be challenging to store items under a pedestal or wall sink, but it’s not impossible. Some stores that sell home furnishings and accessories offer special shelves that can fit around these types of sinks. Alternatively, you can make your own sink skirt that hangs from the bottom of the sink to hide storage bins and baskets. Wall shelves can be made of metal, wood, plastic, or glass. They come in a number of styles and sizes, making it easy for you to choose ones that fit your design tastes. Create shelving above your toilet to hold essentials or even for decorative items like candles. 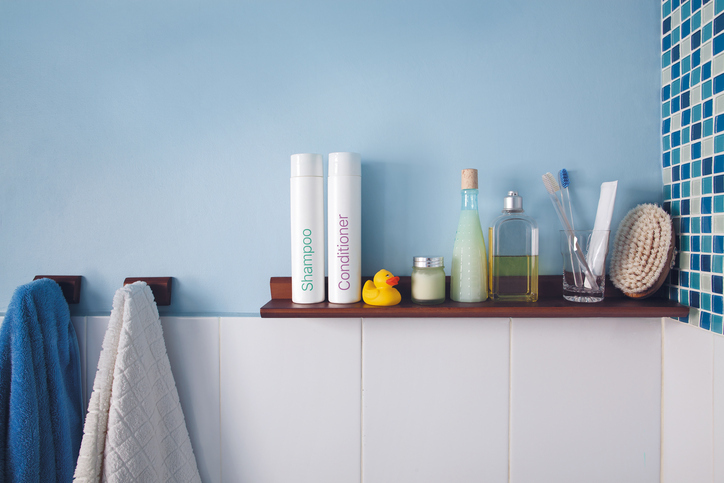 Putting a shelf above the bathroom door is yet another option to make the most of your space. Use this shelf to put infrequently used items. A small shelf or medicine cabinet above the sink can be used for soap, toothbrushes, makeup, or even a couple of plants. At the same time, don’t limit yourself to regular shelves. Get creative by using repurposing items! Spice racks can be mounted inside cabinets or along doors to hold a variety of creams, shampoos, perfumes, and other items. You can also buy inexpensive wood crates, paint it if you desire, and then mount the bottom side to the wall for a unique cubby. Hooks and racks can hold towels, baskets with toiletries, bathing suits, and other clothing items. You can install them behind the door, on a wall, or even inside the shower. Just be careful not to overload them, causing them to fall. Having a bathroom vanity will not necessarily guarantee that your bathroom storage woes will be over. This is especially true if you store towels, sheets, and other items in your bathroom. Add specialized storage space to your home with the help of a trustworthy custom storage company such as Closet & Storage Concepts. We can build custom cabinets and hutches to store linens and clothes to help clear out bathroom space. Bathrooms are one of the most used rooms in any home. As such, it should be both beautiful and practical. If your bathroom doesn’t have enough storage space, start by looking through the items you have stored there and see what you can purge. Next, use the ideas we mentioned to create convenient and easy to use bathroom storage spaces that will accommodate your belongings in a convenient manner. Start creating more space in your entire home! Find a local Closet & Storage Concepts location near you. Photo credits: [Top] Copyright Jodie Johnson. [Bottom] _LeS_.